There is always something going on at the Forward Motion Writer's Community. It's easy to become a member, and the site is free. Maren sold her first novel, ANISE, to Wildside Press. Coincidently, this was a novel she rewrote during the first Forward Motion Writing Dare! January 1, 2001 is the first day of the second Community Writing Dare. We have over 30 people so far, but there's always room for more! There are several categories for this dare, which includes master and apprentice, novel, short story, and rewrite sections. Late-comers are welcome to join. There will be new dares starting in April, July, and October. Check out the information on the Games and Contests page. The site also features a daily writing exercise. These range from "Write an Interesting first sentence" to "Have a conversation with one of your characters." The posts are a lot of fun! Come and join us at the Workshops and Exercises Boards. To defeat the Dragons, Kait and Ry must destroy the source of the sorcerers' power -- the Mirror of Souls. But if they succeed, they will lose the only weapon that can stop Luercas from becoming a demonic god who will enslave the entire world . . . forever. The world premiere of Robin Catesby & Michael Allen Harrison's adaptation of The Velveteen Rabbit was performed at the beautiful 2700 seat Arlene Schnitzter Concert Hall in Portland Oregon, this past December 21-24th. 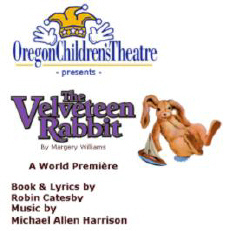 For more information about the production, the script and the music (including the original cast recording CD), visit www.velveteen-rabbit.com .